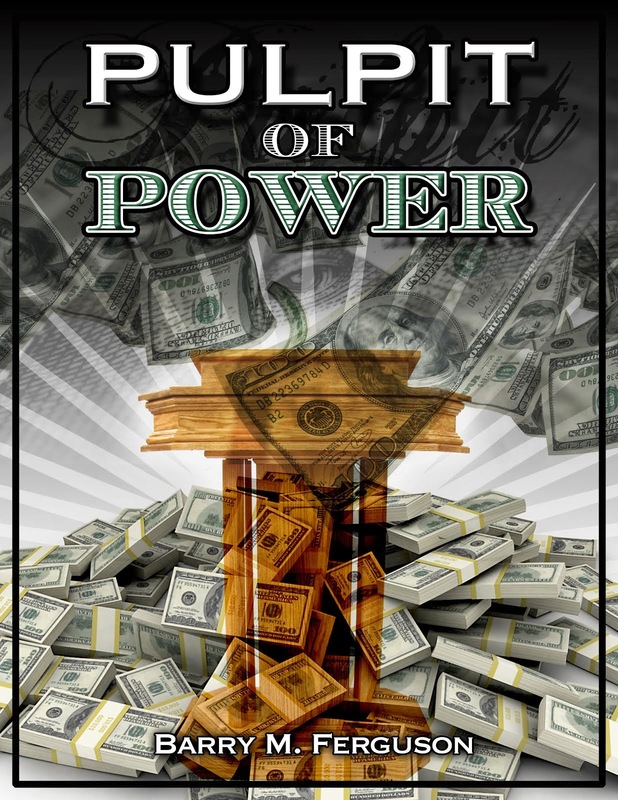 The economies and the governments of the world are all approaching a fork in the road. The right fork leads to the land of austerity and the left fork leads to the land of Zimbabwe. Greece's brakes have failed and they must choose left or right. Their problem is that though they are a sovereign nation, they don't control their own currency. The European Union does. Otherwise, Greece would no doubt follow Zimbabwe and the US to the left in an effort to print their way to prosperity and debt reduction. The EU will of course print the money but austere conditions will be required from Greece in return. This weekend will be consumed by meetings about austerity and printing. Therefore, I have decided to start another company to serve as a consultant to sovereign nations. The company will be called 1-800-BAI-LOUT and here's what I anticipate. Greece is broke but German banks are the one's holding their debt. Other banks throughout the world are no doubt holding derivatives and credit default swaps related to the sovereign debt and they stand to lose as well. Since German specifically is poised to be the biggest loser, Chancellor Angela Merkel is busy trying on the Ben Bernanke mask. How will she solve the Greek debt problem? I could make things easy for her. She could just call me at 1-800-BAI-LOUT and I could fill her in. Here's what she needs to do. 1) Put on a comfortable pair of shoes. 2) Put one of those floor pads in front of the money printing machine. 3) Check the ink jets to make sure the are full. 4) Position the feet so they are slightly wider than shoulder width. 6) Start yanking like monkey on crack trying to get another rock. Now, what does 'austerity' mean? Basically is means living within one's means. It means no luxuries as provided by a government. As abhorrent as it sounds, austerity will be imposed upon Greece. This is the horrible result of debt addiction. Somehow, someway, someone will impose austerity. Debt cannot be infinite. There, I said it. The Truth. I know, I know - a lot of people that just read that last line probably went blind. But the truth has to be told. Hey Angela, are you reading this yet? You don't have a choice. There is nothing for you to decide. You are no longer in control. The banks are and they will get what they want. You don't have the guts or the intelligence to stop derivatives so you will give in to the banks' desires. Come on, A Merk - ring me up and I'll give it to you straight. Print, baby, print. You see, we are all headed to Zimbabwe. The human species is too stupid and too greedy to turn away from derivatives. In order for all of us to live beyond our means, we have to have credit and leverage. Derivatives are the product that fosters credit and leverage. We cannot terminate their use and live within our means. We are entitled to the illusion of wealth. After Greece is bailed out, Portugal and Spain will be right behind them. If not, banks could lose money and that is just not allowed. The good thing is that none of us need a road map to get to Zimbabwe. Our governments will drive us there. Speaking of stupid, our illustrious Congress was on display this past week as a few of them grilled the Goldman Sachs brigade of morally bankrupt executives. Mr. Coborn told one of the Goldman gang to not address him in the current tone as 'he (Mr. Coborn) was not that stupid'. Sir, I beg to differ. Senator Levin looked over his spectacles and accused Goldman of selling 'crap'. Let's review. The questioning Senators helped to surrender the country in August of 2007 to the Central Bank. They proceeded to vote for the bailout of institutions like Goldman that sold 'crap', they allowed the institutions that sold 'crap' like Goldman to re-charter as a bank so they could receive Treasury money, they voted to subvert the Constitution and allow the Treasury to lend money to institutions that sold 'crap', they voted to nationalize Fannie and Freddie to perpetuate the subsidization of 'crap' mortgages, and they also voted to expand the debt of the country on the back of 'crap' derivatives. I think these pontificating blowhards should just sit down and keep their pie holes closed. Else, they look stupider than Jethro Bodine in a 6th grade graduation ceremony. We are doomed. We will not accept austerity. The lies sound better. Derivatives will be continued and debt will be extended to economic oblivion. At least the banks will get their money. That road leads to Zimbabwe. Come on, Angela. Start printing. I've got a feeling that you're going to be busy for quite a while. 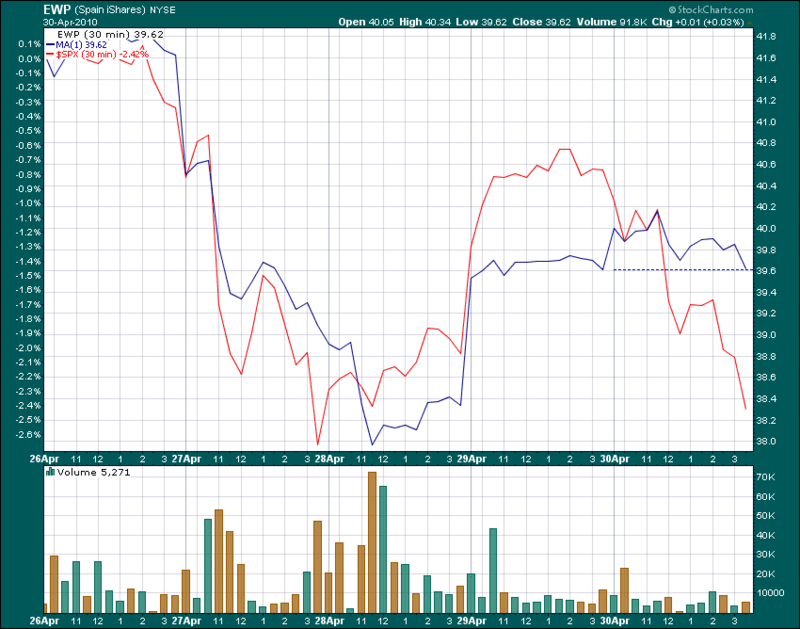 The chart below is the Spain ETF in blue and the S&P ETF in red for the past week with 30-minute bars. 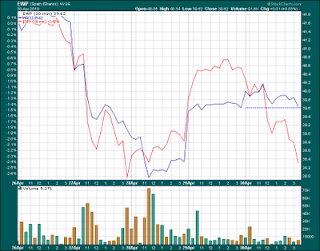 The chart can distort things a bit as Spain was down about 5% for the week while the S&P was down about half of that. I wanted to include this because Spain is hurtling towards bankruptcy and will soon be in the same line as Greece - waiting for a bailout. Yet, they still trade as if they are a viable sovereign concern. For that matter, the world is bankrupt but the stock rally continues. Some day the illusion will vaporize and so too will the market. Brace yourselves. Austerity is likely to become a hated word. So too is reality.